The readymade T-shirts are normally manufactured by stitching its components together. For stitching t-shirt components, you need sewing threads. Now the question is how many meters of sewing threads are required for making a complete t-shirt. I use the thread consumption ratio to estimate thread consumption adding 10% thread wastage, Thread consumption per t-shirt is approximate 80 meters. This length may vary depending on the styling, construction, machine types, seam width, SPI, and wastage of thread in sewing. Based on industry data the average stitching thread required in making a t-shirt is 100-110 meters. Though you will get quality sewing thread spool of 3000 meters in Rs 300-350/- (Amazon store price) and thread cost per t-shirt is below Rs. 1, you should not purchase an excessive quantity of threads. Secondly, if you don’t calculate thread consumption for your garment, you may have a situation where the purchased thread quantity is less and you need to repurchase the thread. To avoid such situation, you should calculate the average thread consumption per garment and total thread consumption for the whole order. For overlock and flatlock sewing machine, use bigger sewing thread spools and for single needle lockstitch machine, use small thread bobbins. That will reduce the machine stoppage due to thread spool change and reduce wastage of thread in leftover bobbins. The thread consumption for a t-shirt and for other garments can be estimated by using standard thread consumption ratio. The thread consumption ratio is shown in this post. Earlier I have published one thread consumption template. You can calculate thread consumption yourself by using that template. 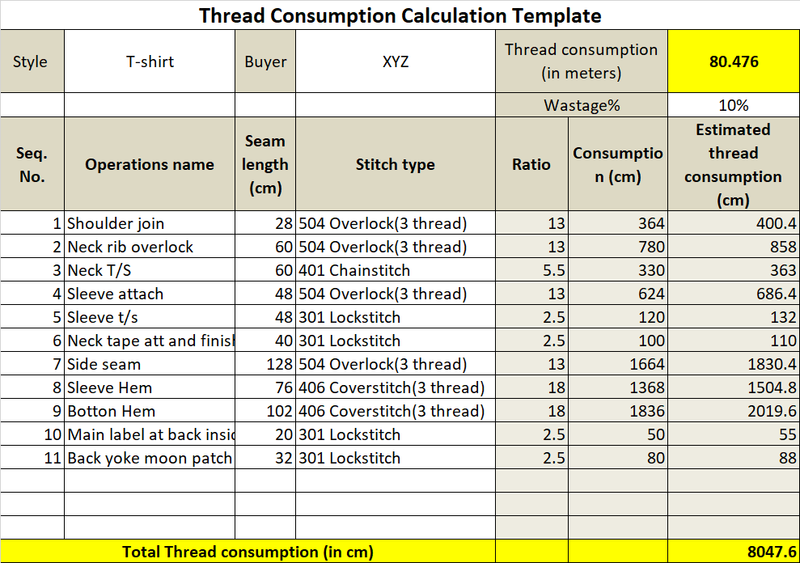 You can use this template to measure thread consumption for any kind of apparel products. To use the excel sheet, you need to know the stitch class used in making garment seams. You might already know that in industrial apparel production, different types of sewing machines are used to get quality stitching and improving production rate. How many meters/yards of threads required for making one t-shirt. Average thread consumption for making t-shirt and thread consumption ratio.